My father Peter Mitchell, the author of this website, passed away at the end of June 2015. Submerged.co.uk was Dad’s pride and joy, mainly because of the huge amount of comments and emails he received about the different shipwreck stories he’d written here. 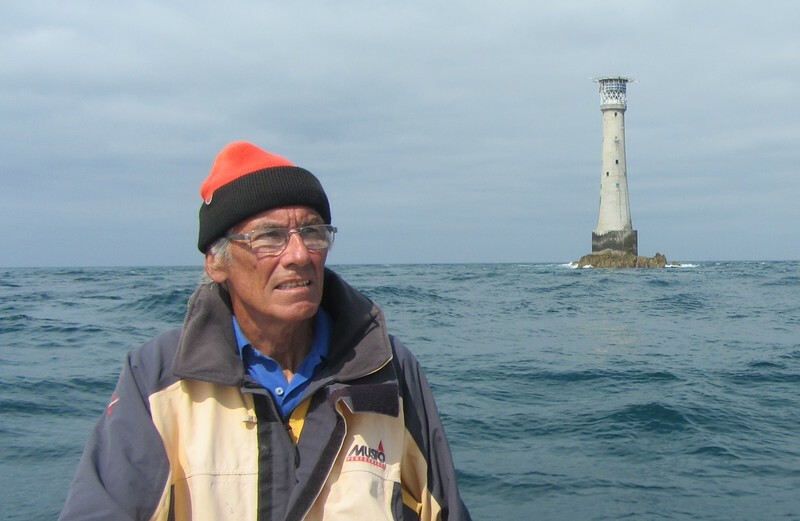 It gave Dad great happiness when people got in touch to share memories of the wrecks – it felt like discovering a secret history together, of events rarely discussed but which had had a huge impact on many lives. And it was a tangible human connection to the dramatic and often tragic events depicted in the stories. I will be maintaining Submerged indefinitely, so there is no danger of this website disappearing. When I read his stories about raising the lump and discovering (cough) the Mary Rose, I can hear the smile in his voice as if he was still talking right to me. Dad made several documentary movies about shipwrecks which proved popular over the years. He would sell them on DVD direct by mail order. I have now uploaded all those DVDs to YouTube so you can watch the full length documentaries for free online. Sadly I don’t have my father’s vast knowledge of the maritime history around Devon so I cannot help with specific queries about individual shipwrecks. However, several of Dad’s friends are equally knowledgable so if you have a query you can leave a comment and I will pass it on. They will try to respond as best they can. You can read Dave Page’s article The Longest Wreck Walk, which is a project about the legends of Jesus and Joseph of Arimathea visiting Cornwall which he and Dad had researched on and off for years. They were still working on it when Dad became ill.
Below is Dad’s original introduction to the site – like the rest of the site, I have left it intact. Even though Dad is gone, this website, like Dad’s books and DVDs, is a reminder that the past is still very much part of our present. My name’s Peter Mitchell. For the last 40 years I’ve been a keen scuba diver. During the last 20 years I’ve published several books and DVDs describing the histories and locations of various shipwrecks around the coast of Devon, England. (Have a look at the book and DVD covers to your right for more details). submerged.co.uk is designed to showcase some of the best bits from the books and be a useful archive of maritime shipwreck history, both for the Devon coast and elsewhere around the world. I also contribute to Submerged’s two sister sites Navy Photos and Cyber Heritage. We like to think we are ‘turning the pages of history, above and below the waves’. If you want to stay informed of when new articles and information are added to the submerged.co.uk site, please sign up for the Submerged newsletter by entering your email address in the mailing list box at the top of each page. Your email address will be kept confidential and not used for any other purpose. Books: You can buy The Wreckers Guide To South West Devon Part 1 and Part 2 on Amazon.co.uk and Amazon.com. They are both available as digital books to read on your Kindle device or using the Kindle app on your iPad or Android tablet. The print versions of the books are no longer available. DVDs: Submerged DVDs are no longer available to purchase. You can watch the full length, unedited DVD documentaries online. Please go to the respective DVD page and press play on the YouTube video to watch the DVD. There are hundreds of shipwrecks off the Devon coast – this section contains a selection of articles about individual wrecks detailing the history and fate of the ship along with the all-important contemporary dive experience. All of these articles come from The Wrecker’s Guide To South West Devon Volumes One and Two. Devon is not the only diving fruit. Here are in-depth reports about expeditions to shipwreck diver’s paradises – Scotland’s Scapa Flow, where the World War One German naval fleet was scuttled ; and Micronesia’s Truk Lagoon, last resting place of the Japanese WWII fleet. More information about the people who have helped produced the books and videos and how to get in touch. Other diving-related websites you might find useful. A very interesting web site – my main interest was concerning HMS WARSPITE at the battle of Narvik as my father (long now deceased) was I believe from his records Chief Gunners Mate. As a keen fisherman i am looking for a wreck map, ideally that can be uploaded on a computor that has a listing of plotted wrecks in the Plymouth area, so i may know where to find them and the history of each one…….then locate and fish them. Most papper maps come in sections and can be bought for around £20 but only say WK for wreck. Do you know of any such thing in your experiance, by the way good work! Very informative website. I have been researching the sailing ship Herzogon Cecilie as I have discovered some 16mm movie film of the wrecking of this ship in some family home movies. The film was taken from a cliff in devon looking down on the wreck as it was being battered by the waves. Now I know more of the history of the grain carrier. My name is Mary. I was born Mary Aquilina. (my mothers maiden name). My husband sent you a email. My Grandfather was Carmelo Aquilina. He worked in the navy on board the HMS Hardy. He was one of 3 Maltese survivors, the others were Giuseppe Micallef (who had shrapnel wounds) and Toni Briffa. My granddad was the wardroom cook on the Hardy. When i was given a piece of paper which a friend had downloaded from the internet, i recognised my granddad right away. I was told by his daughter, my aunty, that her dad had dressed up as a women when his ship was lost at sea, at the battle of Narvik. She told me that she thinks he was awarded a VC. Any Photo’s that i have seen of that time of my granddad, is with Winston Churchill. He stands out because he was quite short and all the clothes he is wearing look so big on him. My Mother has a few Photo’s of her dad in Navy uniform and Aunty said she is sure she has a few. I will try and get them,and scan them into the computer if you would like them. Captain Warburton Lee. V.C. HMS Hardy. The Hardy was not lost at sea ut crashed on the rocks in ofotfjord Narvik. The crew were helped by a Norwegion family who supplied dry clothing for them to wear. Many were dressaed in womens clothes including the Mothers wedding Dress. She is very famous in Narvik’s story of the ba ttle. I have some questions about stills of the shipwreck of HMS Montagu off Lundy Island which you may be able to help me with. Please could you email me at the above address and I will give you more details. would any of your books cover the wreck. ss bantry. lost 1934. kellys coal boat. collision. what other boat was involved? my great,great grandfather was lost along with all others on board. is this correct? no surviviors? ships position is sth. of portsmouth. east of isle of white. any info on this vessel please e. mail me thanks. Dear Peter, Could you advise me if you have come across any archaeological materials in your research fished up from the sea in nets? I’m conducting research for a paper into the impacts of fishing (trawlers, scallop dredges, potting and netting) on underwater cultural heritage both off the UK and globally and I’m putting together a database of all finds found in this way from shipwrecks and submerged prehistoric settlements. Peter, Great to see your new website format. Thanks for all the assitance you have offered by letting me use your Narvik section to drum up interest on these two famous battles in 10th and 13th April 1940. I am now well on the way to finishing the book but only because of your website. Anyone out there with any information or associations to the ships Hardy, Hunter, Havock, Hostile and Hotspur (1940) please contact me. roncope@btinternet.com Thanks once more Peter. I saw your comment on the Flickr website where you mentioned finding a second inscription for Capt E G W Davidson on the Davidson headstone in Thurlestone Churchyard. If you are still interested to know more about Capt Davidson and the Otranto disaster of 1918 please feel to contact me at any time.I will willingly share the story, images, and the research which I have completed. I am the grandson referred to in the original posting and have researched this part of my ancestry in some detail. I’ve just watched the documentary about A7. It was very good and have posted it on my Facebook. It is very important to me and my family that such things are done well. I’m writing a book about bass fishing (“A bass angler’s life”) and wanted to include some information about the Ben Asdale and the wreck at Polridmouth from your website. Would that be OK? I have an interesting set of letters relating to the 1852 Birkenhead disaster that I have transcribed onto a pdf file. My name is Nigel Rowe & I have just finished reading The Doomed Destroyer. I am the nephew of Leading Steward James Rowe who lost his life on HMS Hunter. My wife and I are flying to Narvik in May, to visit my uncle’s grave. My thanks to Ron Cope for a fantastic read.